BIO: Chris Weathers returned to the Pirates for the first time since graduating from Seton Hall in 2013. 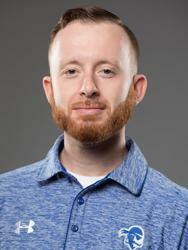 For four years, he was a volunteer women’s volleyball manager under Yaeger. Weathers returns to Seton Hall after serving a year as a graduate assistant volleyball coach at Elmira College where he assisted the head coach with daily operations including scheduling, practice implementation and recruiting. Coach Weathers was also a graduate assistant coach at Southwestern College for two seasons while earning his master’s degree in Business Administration. I would describe my coaching style as unique and cooperative. At first, my coaching style is unique because I did not grow up playing club volleyball but was later introduced to it. I played baseball for 16 years and found a lot of similarities between the two sports regarding movement and skill…except volleyball is a lot more exciting! I also like to think of my coaching style as cooperative because I believe strongly in empowering each athlete in order to become successful on the court. My favorite characteristic in a player is determination. I like to watch athletes strive to achieve their goals, during a match or practice, and enjoy the pure satisfaction of accomplishing them. I enjoy coaching athletes who do not stop at a sign of failure and have the ability to turn on perseverance. Who are the people that have influenced you most as a coach? The people that have influenced myself the most as a coach are my past coaches and athletes. I like to consider myself a sponge and learn from every coaching/playing experience I have. What do you enjoy doing when you’re not in coaching mode? I enjoy being in the kitchen (cooking or baking), traveling the world, and listening to music. What’s your favorite thing about volleyball?